I love beets and try to find many different ways to incorporate them into dishes. However, in my opinion the best way to eat a beet is to simply roast it, add a little bit of butter and kosher salt and pepper and enjoy! Growing up my family’s farm and ranch often times I would only beets as my meal. Then again a freshly pulled beet from the garden just can’t be beat! I chose to roast the beets as opposed to pickling them with the cucumbers and red onions to maintain some of the sweet flavor of the beets. However, when you do add the pickling liquid it will soak up some of it creating a fantastic combination of flavor! This should be served immediately at room temperature. If it sits too long the beets will soak up too much of the pickling liquid. Make pickled cucumbers and onions by combining all ingredients in a medium bowl, mix well, cover and refrigerate for about at least 2 hours or longer. About 2 hours prior to serving the dish, roast the beets. In a cake pan add beets, add water so it comes up about half way on the beets and cover with foil. Roast in a preheated oven at 400 degrees for about 1 – 1 1/2 hours or until soft when pierce with a fork. Remove and set aside to cool. Once cool enough to handle, remove the stems and peel the beets. Keep in mind beet juice is a dye, so if you have clothing on that you don’t want stained break out a lovely apron if you have one! 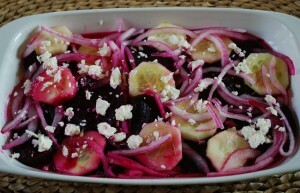 Arrange beets on platter, along with cucumbers and red onions and drizzle over salad. Sprinkle a tad bit of kosher salt evenly over salad and top with crumbled feta cheese. Serve immediately.